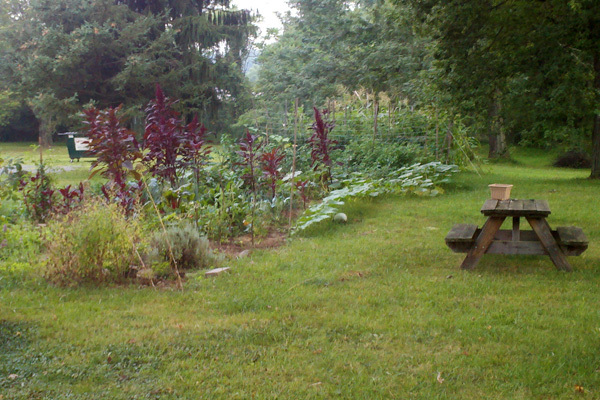 Get a robust garden like this in August by doing some important chores now. - Weeding, weeding, weeding: Weeds can really cause issues for your garden plants. Along with being a bit unsightly, they can stunt plant growth via stealing nutrients, crowding roots, and even blocking sunlight as weeds can grow much faster than your vegetable plants. A bonus of weeding, you can throw the pulled weeds in between rows as a green much. Speaking of green mulch, lawn clippings make a great garden mulch, helping to choke out weeds and providing future soil nutrients as they break down. - Thin seedlings: Yes, it can be tough to pull those poor little growing plants, but garden plants need room to grow and if you crowd them, it’s basically has the same negative effect as a weedy garden. Some thinnings such as chard can be added to salads. Consult a reliable online source for information on how much space each plant needs. - Train your plants and offer your support: No, this doesn’t mean you can teach your bean plants tricks, nor are your tomato plants necessarily feeling down. Now is the time to give your plants the proper support they need to prevent them from falling over, snapping, or to get the vegetables like eggplant and tomatoes off the ground where they are easy targets for pests. Do some research on the best support for plants such as peppers, tomatoes, and any vine plant such as pole beans. One tip: many varieties of tomatoes will outgrow your tomato cage, and fast. - Watch for pests and disease: It’s a very good idea to do a daily sweep of your garden to look for any signs of trouble. For example, holes in the leaves are a sign of pests and you may need to apply a pesticide of your choice (there are many organic varieties out there both homemade and store-bought). Completely missing leaves, or, God forbid, missing plants are a sure sign of four-legged pests such as rabbits, deer, or groundhogs. Unusual changes such as extremely wrinkled or yellowing leaves are often signs of some sort of plant disease, and you definitely need to do some research into what you are dealing with and how to stop it. Diseases and pests can destroy a garden in a surprisingly short time, so you need to act fast. - Plant! : If you have lost plants to pests, seeds didn’t germinate, or your spring plants have run their course, don’t fret too much, you can still plant seeds or transplants. The warm June soil is perfect for most seeds such as corn or beans, and many garden centers are starting to offer plants at a discount. - Water deeply: June is climatologically our wettest month, but you can still have dry spells. Now is the time to water less frequently but deeper to encourage strong plants via deep root growth. Soaker hoses are a good investment to enable the sort of deep watering your plants need.